The name of the game is speed-Speed Medals, that is. Equip as many as you can; otherwise, you may find yourself in a sticky situation. 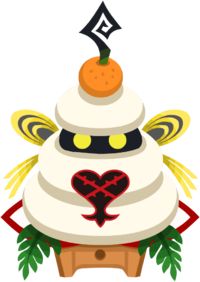 The Round Rice Cake is an Emblem Heartless that appeared in Kingdom Hearts χ during the New Years event in 2014. The Round Rice Cake and its variant, the Large Rice Cake, are based on kagami mochi, a Japanese New Year's decoration consisting of two round mochi or rice cakes. A smaller mochi would be placed on top of a larger mochi, symbolizing yin and yang, the going and coming years, the human heart, and the moon and the sun. On top of these mochi, a daidai, or Japanese bitter orange, would be placed, to symbolize the continuity of a family from generation to generation. It would be stood on a sanpō, or stand, over a sheet called shihōbeni, which is believed to ward off fires from the house for the years to come. The Round Rice Cake's body appears to be made of a combination of the aforementioned smaller and larger mochi, and its head appears to be made of mochi as well. On top of its head is the above-mentioned bitter orange. A black stalk appears to be growing out of that orange. Behind its body is a yellow and grey obi, or sash, tied in a bow. At the bottom of the Round Rice Cake's body are two green leaves, and below these is a white shihōbeni with a red border. It stands on a brown, wooden sanpō.